The IC-F1000 series has a 24.5mm (0.96 in) slim depth with IP67 waterproof casing. The transceiver can withstand 1m depth of water for 30 minutes. Its dust-tight construction prevents the ingress of powder dust, sand, mud and other objects. With a built-in motion sensor, the IC-F1000 series can detect its position, state of motion and non-motion and can send an emergency signal. The motion function detects if the transceiver is moving or shaking, for example, during a chase. The lone worker and man down functions are programmable. 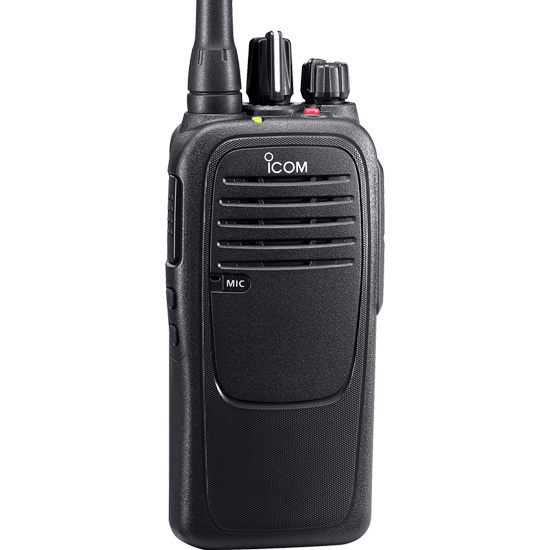 The IC-F1000 series has built-in 2-Tone, 5-Tone, CTCSS and DTCS signaling capabilities for group communication and selective calling. The following MDC features are programmable. The large 36mm speaker of the transceiver provides clear companded 800mW* audio. The built-in BTL amplifier doubles the audio output power and delivers loud and intelligible voice to a radio operator working in noisy environments.